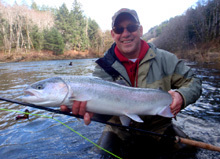 Tight Lines Fly Fishing will be hosting a trip with River Runner Outfitters and Anadromous Anglers to the beautiful Oregon Coast and the Portland area this March for chrome bright winter steelhead. We will be throwing Skagit lines and intruders searching for the heavy pull of a wild steelhead fresh from the ocean. Lodging for the first four days will be at a beautiful beach house in the Netarts, OR area. The house will sleep up to 7 people so we are taking a maximum of 6 anglers plus your host. Meals will be provided by the skilled staff at River Runner Outfitters. Each day begins at 6:00 am with coffee and breakfast at the house. Breakfasts are light but hearty and designed with steelhead fishing in mind. The guides will swing by to meet us at 6:30 am. Lunch is served on the river by your guide, and may include a variety of hot and hearty soups or sandwiches. Dinner is served each evening*, preceded by appetizers and fresh salads. Meals feature locally caught seafood and farm fresh meats and produce. Food is a passion that ranks right up there with fishing, and we are confident you will not be disappointed. After the fourth day of fishing, we will drive back to Portland where we will check into a local hotel to prepare for the next part of our journey . Our last day of fishing will be spent with the guides from Anadromous Anglers on one of the Portland area rivers so you can experience the great fishing opportunities within an hour's drive of the city. Price Includes: Transportation from Portland to Netarts, Oregon, 5 days of guided fishing (2-3 anglers/guide), breakfast and lunch Thursday through Monday, dinner Thursday through Saturday, all gratuities and lodging. Not Included: Airfare to Portland, OR, meals on days of arrival and departure, *dinner Thursday and Friday, alcoholic beverages and Oregon fishing license/steelhead tag.